HTC, an increasingly popular smartphone maker and the single biggest player in the Android business, just announced its financial results for the first quarter of this year, and they simply couldn't be any better. Revenues rose 19.3% year-over-year to NT$37.7 billion (US$1.2 billion) from NT$31.59, blowing way past the analysts' forecasts of NT$32-34 billion and even HTC's own expectations. Net profits rose 3% year-over-year to NT$5.03 billion (US$158 million) from NT$4.88 billion. Sales rose 33% compared to the same quarter a year ago. HTC's shares are trading at NT$401.50 this morning, +5.38% from last night's close of NT$381 (morning Taiwanese time that is, it's 8PM Pacific here). 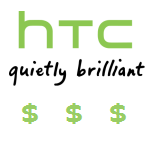 Morgan Stanley recently raised its target price on HTC from NT$423 to NT$450. Macquarie Securities reiterated its "outperform" rating for HTC with a target price of NT$420. Goldman Sachs maintained its "buy" rating for the company. BNP Paribas Securities said that it has raised its forecast for the sale of HTC mobile phones this year by 9 percent -- from 14.5 million to 15.8 million units. It has also raised its forecast for next year to 21.9 million units, up 22 percent from its previous forecast of 17.9 million. HTC recently changed its branding strategy from selling its phones to be rebranded by other companies to using its own brand. This was done to better compete with large manufacturers such as Nokia and Motorola. HTC's change of direction seems to be working as the better-than-expected financial results speak for themselves. LG Eclipse/LU2300 Info Leaked - Can Powerful Specs Make Up For A Creepy Psychedelic UI?